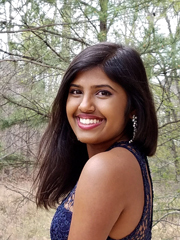 Indian-American teens shed light on the tricky, sometimes painful aspects of constantly slipping in and out of two vastly different cultures—and learning to celebrate both. This may sound like a setting for a joke, but there is no punch line here. All there is, is the hard work that Indian-American teenagers face of negotiating life amidst two cultures that are, at least at face value, vastly different and often at direct odds with each other. 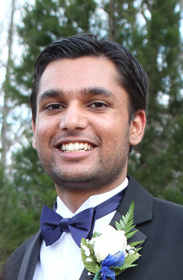 A classic example of such dilemmas is the young Indian-American boy who fantasizes about landing a prom date, while simultaneously fearing the wrath of his parents, for whom “dating” is a bad word! 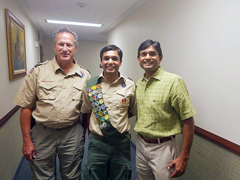 (Right) Kyle Patel, the author of this article, seen here with his scout leader, and his father. For teens who grow up as virtual embodiments of these contradictions, it can be hard work negotiating the choppy challenges that everyday life keeps throwing at them—at school, work, and in social situations. Having choices is good, but it can also end up being a bit overwhelming when just about everything in your life splits into two distinct worlds: will it be rock-and-roll hits this morning on the radio, or will it be Badtameez Dil? Should I wear the salwar-kameez on International Day and proudly proclaim my heritage, or should I just play it cool and sport a jeans and blazer? Ah, let’s see, we have both an Arijit concert and a Pitbull concert this Saturday evening…which one shall it be? Then there are the social dilemmas: here comes mom’s friend; should I be calling her auntie or masi? And after a hard day’s work negotiating between two cultures, I am finally ready to indulge myself with some comfort food. Let’s see, will it be pizza or pakoras?! No doubt, being bicultural can certainly be more demanding than growing up in the singular culture of the mainstream. That it may ultimately be more rewarding may be little consolation for a young teen often caught between the pulls and pushes of two sets of values: Eastern and Western. It was none other than Rudyard Kipling who, over a century ago, had famously proclaimed the incompatibility of these two worlds: “East is East and West is West, and never the twain shall meet.” But what of the struggles faced by budding souls who are now growing up in a world where not only have the East and West met, but they are constantly overlapping and nudging each other for priority? As one of the most diverse nations on the planet, biculturalism is especially relevant to the United States. As second-generation Indian-Americans, we have experienced bicultural upbringing firsthand and can attest to the wide variety of factors influencing its overall richness. 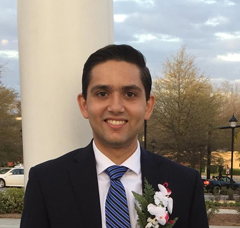 The experiences of second- and third-generation Indian-Americans, however, are increasingly complex, and navigating the arenas of both cultures has given rise to a unique set of challenges. Here are a few perspectives shared by teenagers to shed light on the various nuances of such an upbringing. To be born bicultural is to be a beast of two nations. We are beings of disparate pieces, struggling identities, and broken histories. But we take pride, for we are like no other. In 1992, two ambitious young adventurers, rooted deeply in the rich soil of India and the lush traditions and histories of a collective Hindu ancestry, arrived in New Jersey to set their feet upon the land of promise. My parents were pioneers, the first in their families to reach a new frontier. Yet make no mistake: my parents were, are, and forever will be Indian. And perhaps my own children will settle in this great nation whose horizon is flung far from sight of their grandparents, and be able to call themselves, wholeheartedly, Americans. And perhaps they will truly believe in and comprehend the power of that title. But as for me? I have never disembarked. I am still on that journey to home, that journey from home; whether I hurtle westward or eastward I do not know. My parents are Indian; my children will be American; I am Indian-American. Growing up, I have realized the most profound of truths through time, triumph, and tears. I may be merely 16 years of age, but I have lived. I have lived, and I have learned. And it is through these experiences that I have endeavored all my life to mold myself in my best image. However, through my formative years, I was never given the luxury of choosing the pieces of me that mattered the most. It seemed that it was ordained long, long ago that it would be my chocolate-hued skin that mattered first, and the person who lived behind it, second. Ironically enough, those few fortunate times I have traveled to the land where brown eyes, black hair, and academic zeal seemed the norm rather than the exception, I find myself yet still a stranger in a strange land. It’s not my physical appearance now. Maybe it’s the stuttering Telugu accented with tinges of Americana, or perhaps it’s the way I swing the cricket bat that gives me away, but in a country of over 1 billion it feels like I’m spotted instantly. Am I forever to be an Indian in America and an American in India? Now really, that is a rhetorical question, but I’ll go ahead and say the answer is yes. This is a part of us we will never shake––have hope! Truth be told, I am far too dramatic for my own good. I have presented to you a narrative detailing the horrors of walking the road in between. But the truth is, we are not a house divided. We are not confused. We are uniquely us. We are boys and girls, who cannot be defined by where we are from, where we are now. We are defined by who we are as individuals. And in us, we will always carry the vestiges of our heritage while gaining the marks of our new world. Quite frankly, being bicultural is amazingly awesome. It’s putting in headphones and listening to Bollywood in one ear and hip-hop in the other. Wearing jeans and a kurta to school. Going to garba one weekend, prom the next. We keep with us the stories and the truths that others can neither know nor understand. Not our parents, not our children, not our schoolmates, not our kin––just us. We are neither Indian nor American and we refuse to choose. Because we should already know what we are. We are Indian-American. Biculturalism provides two of everything. Two languages. Two cultures. Even two lives. I am a second-generation Indian-American, brought up by my parents who were both born in the homeland. My mother came to America at the age of seven and finished high school here, while my dad came later after their marriage. In simple terms, my parents are well assimilated into “American culture.” They do not have distinguishing Indian accents or display any considered “un-American” mannerisms. I was brought up with their values and America’s: to celebrate my freedom and youth while staying rooted in my religion and traditions. But did I mention I am a female? Ah, yes, that is what adds a twist to my bicultural life. Simply by my gender, I was born into a culture that has historically subordinated the role of a wife to that of her husband. A culture that expects me to do the dishes while all eight of my male cousins played football outside. A culture that has taught me to serve water when the guests came, to smile politely, and appear attractive. By no means was I brought up completely under these pretenses. However, in parts of India and the world today, these deep-rooted ideas of our culture prevail. Distant cousins on my dad’s side of the family were married off at eighteen, the same age as I am now, to presumably start having children and cooking and cleaning the home. But in America, I was free. Under the wings of liberty, I grew up believing men and women are equal in character, strength, and opportunity. I was taught to prize my intelligence and voice my opinion. I was taught not to sit quietly at the dinner table during discussions of current events. But don’t get me wrong, for I am a bicultural individual. Two cultures. Two lives. I have had my share of experiencing the gender clash of expectations. At home, my brother and I do equal work cleaning after dinner. However, when guests come over or we go to another person’s house, this equality vanishes. I am expected by many adults to stay in the kitchen and help clean up everyone’s mess, in comparison to the minimal effort my similarly-aged male cousins put in. This is one example of the many, many experiences in which my genderequality, feminist, liberty-loving side clashes with the traditional Indian female stereotype. Taught in school to work hard, at home to be fair, in the Indian social setting to be traditional. It is an issue, a difficult one. Love for my culture fights the burdening expectations of tradition. Colored by his bicultural existence. Growing up, I was bombarded by the usual array of questions from inquisitive middle schoolers. As I brought my exotic blend of Indian cuisine to a sea of chicken nuggets and ham sandwiches, my classmates clamored in fascination at the lunch table, and I would proudly give them a taste. It never occurred to me that the food I shared with my classmates in school had become part of my identity until I was recently accepted into college and realized that the time had arrived for me to forego that homestyle Indian cuisine for a time. However, the sensation of sharing that Indian food with others and being the star of the lunch table every day in middle and high school never left me, and I know that despite being raised with American cultural influences, I will retain my Indian values and even try to share them, just like my lunch food every day in school. While my food is interesting enough for most of my American-cultured classmates, I often get the question of why I am vegetarian in more casual settings like Chick-Fil-A when I sit down with my large fries and milkshake and classmates stare curiously at me over their chicken sandwiches and chicken biscuits. Beyond my Hindu beliefs, being a vegetarian is a way of life for me to respect the world that provides my food. While others meaningfully recite prayers before eating, I attempt to preserve the values that I believe make human beings distinct from any other animal on the planet. Our wisdom has allowed us to respect and preserve life, and being a vegetarian incarnates my belief that through this wisdom, I can simultaneously respect the value of another species while providing for my own sustenance. This way of life defines my thinking and perspectives rather than just stemming from my religious background, and despite the strange looks I get when asking for beans instead of beef on my Mexican Pizza at Taco Bell, I stand resolute in the ideals and central philosophies from being Indian that have guided me in my life as an Indian-American. You can be anything you want…as long as it’s a doctor, lawyer, or engineer! 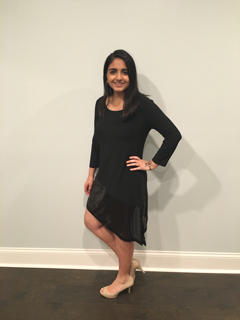 Growing up in an external American environment and an Indian one within the home certainly gives rise to a unique—albeit shared—set of experiences. 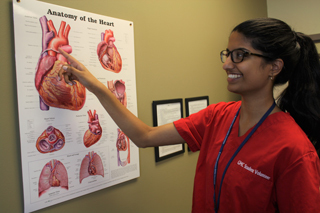 We’re all familiar with the stereotyped “Indian” careers youth are expected to follow, but there is definitely a difference of expectation in the Indian-American community that has arisen from the shift to this bicultural setting. When we are little, we are brought up to believe that we can be anything we want to be, from astronauts to princesses to even President. However, as we mature and experience life and the world, these aspirations shift. 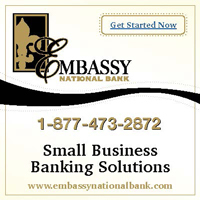 As factors like income, job stability, and projected job growth begin to weigh heavily on our choice of career, we find that our pool of options shrinks. Being Indian-American further complicates this selection process. There is a well-known stereotype that Indian children are expected to become doctors, lawyers, engineers, or professionals in other “respectable” fields. Given that it is a stereotype, its merit varies depending on the Indian household in question. While some Indian-American children naturally follow this path, others do not. Those who have passions in more artistic and creative fields often have no choice but to submit to this stereotypical career pressure. Growing up with an Indian-American bicultural identity is riddled with instances in which the end result is having to compromise between traditional Indian culture and progressive American culture. Over here, society itself is very open-minded, with the arts and humanities being embraced as quintessential parts of the American lifestyle. Most kids idolize movie stars and singers over famous intellectuals. It is hard not to get swept up in the arts when being raised amidst a culture that so heavily emphasizes creative expression. 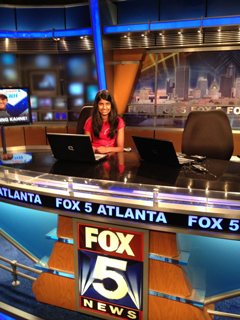 The dilemma leaves some Indian-American children torn between respecting their parent’s wishes by pursuing a STEM-based career and following their passion by pursuing an artistic career. As someone who is still deciding on a definitive career path, I am incredibly lucky to have the opportunity to select from any type of field without being forced down one particular route. I cannot say that is the case for other Indian-American kids. I have had friends pushed down the path of medicine when they would rather pursue writing, or are rebuked for wanting to pursue less conventional science majors. Is it difficult to be successful in creative professions? Yes. Is it possible? Of course. People like Mindy Kaling, Aziz Ansari, and M. Night Shyamalan are living proof of it. As Indian-Americans, we are constantly searching for our identity, trying to figure out what truly makes us, us. Biculturalism is certainly a spectrum and each person discovers their own position on it based upon their experiences, influences, and upbringings. Finding the right balance is probably one of the hardest things we’ll do in our lives, and consequently, the most important. My dad has always called me an “IBCD”, a play on the popular term “ABCD”—American Born Confused Desi. I, however, was born in India, which is why I’m an “Indian Born Confused Desi”! I’ve lived in the United States since my first birthday, and I’ve grown up wearing riding boots and running shoes. 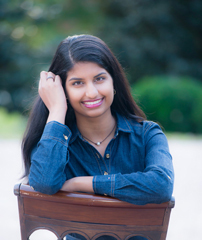 Each morning as I chose which Abercrombie shirt to wear to school, the Carnatic music playing in the kitchen clashed with Taylor Swift blasting in my room. Like many Indian-American youngsters today, I practiced an Indian lifestyle at home while growing up in a Caucasian-dominant community. I was a shy child; I typically kept to myself, and I rarely mentioned my Indian background to my peers at school. Rather, I deliberately set out to conform to the seemingly “stereotypical” American lifestyle in an attempt to fit in. As I entered my teenage years, I noticed a change in those around me. People were increasingly confident in sharing their backgrounds, whereas I was still hiding under the sanctuary of my alter persona. Around this time, I got to know more and more people, which led me to an epiphany: stereotypes are what we make of them. There is no “stereotypical” American, and there is no “stereotypical” lifestyle that we are all bound to follow. We neglect the importance of community in the presence of differences in culture. A habit that I recently adopted is striking up a conversation with new people, whether it be while waiting in line at the grocery store or during my weekly long runs. If we are more open to interacting with people of different backgrounds, these sharp cultural differences won’t hinder us. In fact, our differences should work as conversation starters rather than something we feel the need to conceal. That said, my struggle of coming to terms with my identity as both Indian and American has transformed me into a more open-minded and outgoing person, and I can proudly say that today, I am no longer confused about my identity. “Bollywood Guy,” Jeffrey Jacob: Now, and from his childhood, dressed as Josh, the title character from the 2000 Bollywood remake of West Side Story. 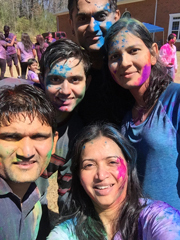 A lot of us have felt it necessary to shy away from our Indian side at times because we want to “fit in.” Throughout elementary and middle school, this was certainly required if we wanted to be part of the “cool kids club.” However, as we entered high school and beyond, we found ourselves coming back to the very culture that we enjoyed as young children. My love for Bollywood movies came from my parents, who would show them to my siblings and me just as frequently, if not more, as they did English movies. To my parents, movies were a way for us to stay in touch with the beautiful culture they grew up with. 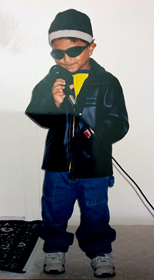 In my early years, it was easy to maintain this love, but as soon as I started school, things changed. I went to a school with a primarily white student body, and as such I had no friends with whom to share this interest. Suddenly, this love for Bollywood became a burden. I couldn’t keep up in conversations about new English movies or songs. I was told my interests were “uncool” and even though I had spent just as much time as my peers living in America, I felt “un-American.” In the years that followed, I tried to adjust my interests. I watched fewer Bollywood movies and bought CDs by American artistes. Soon, the only part of me that was Indian was my skin color. My experiences are not unique. Every person raised in a country different from that of their ancestors will experience moments of cultural conflict. For fear of being different and “un-American” I kept Bollywood at home. However, as I grew older I came to the realization that the only person who could determine whether or not I’m American is me. My Indian culture is not mutually exclusive from my American culture. I began to embrace both sides of who I am. I started watching and listening to Bollywood movies and songs again because they matched my expressive and freewheeling personality. I performed “Badtameez Dil” at my high school talent show and soon enough I became known there as the “Bollywood guy.” I still continue to watch and listen to English movies and songs. Today, I enjoy both sides of who I am. "who knew that an old cylinder could please so many people? I think I have finally found the answer. It was not the cylinder but the sharing of an old culture blending with the new that catalyzed the spontaneous, joyful reaction of the audience." The term biculturalism is easy to understand, but culture itself is a complex, diverse mix of ideologies, customs, practices, and religions. 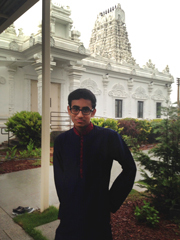 In keeping up with our “other” culture in America, many Indian-American youth engage in traditional practices from India. Music is one of the most common manifestations of this custom, and it can have a deep impact in making us realize how much a bicultural lifestyle has enriched our lives. Three hours of rhythmic beats systematically weaving through a river of vocalizations and instrumental sounds. Three hours of beauty. What made those beats and sounds? The mridangam. Each distinct sound that came from the barrel-like item on stage was a magical reverberation from the universe. Who knew that an old cylinder could make noises as soft as raindrops, plop-plop, and almost instantaneously crescendo into a thunderstorm? Although I was introduced to Indian culture through a sound maker early on in my life, I never truly understood what it was. Going to a class on Sundays for two hours didn’t emphasize it, nor did my parents’ frequent reminders of how much of a failure I was compared to my cousins who had all gone to IIT. Throughout my early years, I didn’t feel any legitimate connection to India other than the basic beats I banged onto my drum every Sunday. I read my Harry Potter books and kept out of the way of all the uncles and aunties wherever I went. Seldom did my eyes ever leave the page to take in my surroundings. As I transitioned to high school, my books began to change. J.K. Rowling was replaced by Dr. Richard Feynman, and my chemistry textbook occupied almost all my free time. However, the banging of my drum was consistent every Sunday, without fail. As I was playing in class one Sunday… dhum-dhum-dhum …syncopation, derivation, photosynthesis, Fundamental Theorem of Calculus, rhythm, all of it began circling in my head, and I finally realized, I couldn’t keep to myself like this anymore. It was time for me to embrace my culture and take pride in it. As I carefully lifted my head up, I saw the other students and audience around me for the first time. Amazingly, I was not just seeing thousands of duplicates of my parents reflected at me in the audience. Rather, I saw the smiles on the faces of my fellow young Indian-Americans in the front row as the dancer performed to the beat of the drum. For the first time in my life, I felt that I was a part of this culture as well. That was the moment that led me to ponder this question—who knew that an old cylinder could please so many people? I think I have finally found the answer. It was not the cylinder but the sharing of an old culture blending with the new that catalyzed the spontaneous, joyful reaction of the audience. Biculturalism comes with a boatload of benefits. Despite what the current political climate may suggest, biculturalism, as far as individuals are concerned, and multiculturalism, as far as societies are concerned, is the way of the future. Not only is it inevitable in a connected world, but also comes with a boatload of benefits (See Sidebar). Where the United States will go as the population becomes more and more diverse, and what kinds of challenges and benefits this will bring is an important consideration for everyone living in America. Navigating the colorful, capricious, free-thinking world of American society is undoubtedly a challenge for anyone not familiar with the customs and practices of the Western world. These cultural differences arise from varying viewpoints on fundamental issues of morality, and they are steeped in deep, recurring traditions that have lasted until the modern day. As innumerable second-generation Indian-Americans will agree, we have been granted passage into both worlds, but with certain limitations that inhibit full engagement with one or the other. However, the Indian-American community is expanding with each generation, and people are more engaged. This allows them to employ both cultures in their daily lives and enjoy the unique status of living as biculturals. 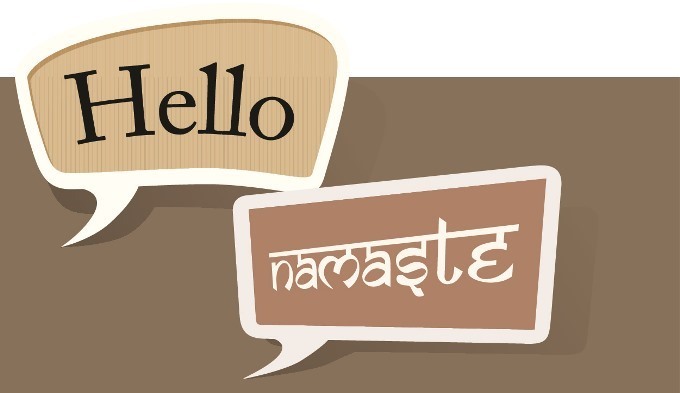 Moving forward, the importance of understanding multiple perspectives is becoming increasingly important in America, something Indian-Americans can readily implement from their experiences. Growing up in two distinct environments allows us to make outsized contributions to society and become an asset to our adoptive country. 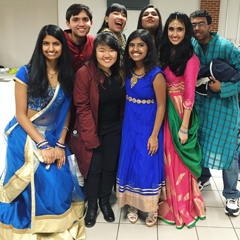 There is a reason why the Indian-American community is often described as a model minority. For a group that is only about one percent of the population, we make up over 6% of physicians in the country, own close to half of all economy hotels, monopolize spelling bees, and have similar significant representations in just about all sectors: academia, scientific research, technology startups, corporate America, small business, the performing arts, cinema, politics, and on and on. Biculturalism itself has tremendous benefits, but Indian-Americans in particular represent one of the greatest success stories that have resulted from it. 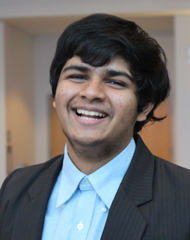 Kyle Patel is a high school senior at Gwinnett School of Mathematics, Science, and Technology. 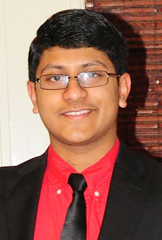 He is currently on a year-long internship with Khabar magazine through his school. In the study of biculturalism, there is a widely accepted model of second-culture acquisition called the Alternation Model, which is explained in the 1993 journal publication Psychological Impact of Biculturalism: Evidence and Theory by Teresa Lafromboise, Hardin Coleman, and Jennifer Gerton. Essentially, bicultural individuals who internalize such a model are able to switch between their two cultures in an effective enough way that positively benefits their life. Researchers of the Alternation Model have speculated that the ability to alternate between two cultures leads to the exhibition of higher cognitive functioning and mental health status. Such a finding also complements research that has been done on bilingualism. In the brains of bilinguals, the two language systems are active simultaneously and at times in conflict with one another; however, this conflict is actually more beneficial than harmful because it forces the mind to internally resolve the conflict and cognitively strengthen itself. A 2004 study by psychologists Ellen Bialystok and Michelle Martin-Rhee showed that bilingual preschoolers were able to sort blocks of one color by shape in a bin marked with a conflicting color faster than their monolingual counterparts. This same type of internal conflict and strengthening in bilingualism can be extrapolated to biculturalism, especially in situations of conflict where the mind has to subconsciously resolve situations and possibly alternate between two cultures.